The countries of medieval and post-medieval Europe were rooted in certain coherent and harmonious principles. Taking into consideration different circumstances, various consuetudinary laws provided the foundation for the institutions of medieval Europe. What is a consuetudinary law? Consuetudo in Latin means habit, or custom. Consuetudinary is a term applied to a law that was formed by customs, not by a decree or regulation issued by a civil authority. For example, in a men’s club some gentlemen attend only several times a year, others go often, and then there are those who go everyday. Among the latter, there is this or that one who finds always the same chair, seats himself and spends all his time there. In that chair, he reads the papers of the day, orders the waiter to bring him a drink and smokes his cigar. People who want to talk with him find him there, and when he is alone, he naps a little there. In a club where there are many empty chairs and one is always occupied by the same individual, his custom to sit there is respected by the other club members, who do not sit in it when they see it unoccupied. They say, “This is Dr. X’s chair. Soon he will arrive and sit there.” Out of respect for him, the other members formed the custom of leaving that chair for him. Dr. X has no legal right over that chair, but a habit was established in his favor that is worth more than a right. This is a consuetudinary law that was born from custom, not from the club statutes. 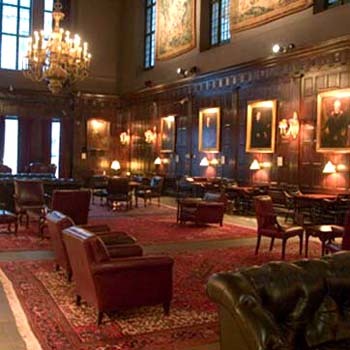 There is no written law that says: “The red leather chair on the left side of the fireplace in the library must be left free for Dr. X.” The statutes are not concerned about such matters. Rather, this is a non-written law that takes root from a simple daily custom. These simple customs in the club or the home constitute the charm of life. In a country as well, some of the laws are not born from decrees but from customs and are respected by everyone. The charm, the perfume and sweetness of a country comes from its consuetudinary laws. 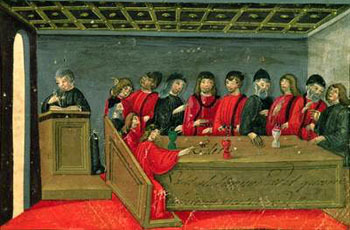 Civil law in the Middle Ages was born from experience, customs and traditions. Not even the King was above the law of the land. In this respect, medieval law relied on the old German principle that the State was subordinate to the law, in contrast with the Roman classical tradition that the law is made by the State. In an organic society, custom should be the source of the written law. A written law that has no connection to the customs is often an absurd law. For this reason, the two spheres - the written law and the customs - are different in each country because they are in accordance with the mentalities of the different peoples. A law that falls into disuse is abrogated. It normally is set aside because it has been replaced by another custom. In this way, the customs of a people become law without the need of a house of representatives. Instead, what happens is that after several generations follow a certain custom, it ends by acquiring the force of law. So, a custom practiced by one generation and accepted by their sons and grandsons becomes a law that provides them with social stability, social structure. I believe that knowing these concepts about how customary laws are born and their benefit for society would do a good for Americans. These ideas could be tossed over Americans like a kind of golden confetti to counteract a series of wrong ideas that the Revolution planted in their minds. For example, as a consequence of the French Revolution, the notion was planted in the American mentality that every youth is thirsty for liberty, eager to free himself from the influence of his ancestors, disposed to disregard what his parents and grandparents advise him, and only able to find happiness when he is completely unrestrained and liberated. The opposite is true. It is perfectly natural for Catholic youth like yourselves to be calm, tranquil, find peace of soul and benefit from listening to what someone who is older tells you in order to prepare you for the future and protect you. The mutual respect we have for one another in our meetings testifies to the organic and noble relationship we have, where you respectfully ask for orientation and I gladly give it. This organic custom of having our meetings is transformed into a strong and fecund bond. You are committed to attend these meetings, follow these topics of interest and ask more questions, and I have the duty to give you the requested orientation. You are not following the false idea that each one has to start his life from ground zero. You take advantage of what I have learned and transmit to you, and I am pleased to see that what I learned, often with effort and sacrifice, will bear fruit for the future. This is how a good moral order is transformed into a custom, and how custom tends to become a law. I believe that this is the atmosphere where true liberty can expand. With the dominion of the Revolution, however, this understanding of liberty born from custom could not find a way to expand; it lost its value in public opinion. On the contrary, an artificial atmosphere was created favoring those who affirmed the opposite. People became intoxicated with the ideas that the institutions must live independent from the customs, and the customs must live independent from moral principles. The laws of today’s institutions are no longer based on customs, and the customs are not founded on moral principles. The only custom that dominates almost everything is this: “Do whatever you want that is not forbidden by the law.” This is a false notion of liberty.